Electronic Health Reporter is part of millerrupp’s publishing division. Along with this site, millerrupp also publishes Education IT Reporter — both of which are independent voices serving their respective communities; giving a platform to thought leaders, providing insight, news and opinion to each sector. Through this site, we look forward to continuing to create great, independent content for healthcare. Support the effort by submitting your free content for publication here. On its own, millerrupp partners with IT and software companies to lead their public relations, content marketing, editing and writing needs. The firm helps its clients create a stronger presence in their respective markets, build brand awareness, educate buyers about their products and services, and, ultimately, sell more products. However, our publishing division is completely separate from our PR division; there is no crossover between the two. But, millerrupp’s team has a strong background in journalism (we are award-winning writers and bloggers), as well as first-class RFP coordinators! We understand and “get” the power of compelling content, and we are experts in producing new content: Thought leadership, bylined articles, blogs, white papers, case studies, website copy, marketing collateral, RFPs – you name it, we love to write it. 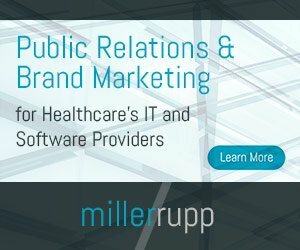 millerrupp: Specializing in public relations, marketing and content creation for the world’s best IT and software companies.